Peptide (C)EDGKPLEVPEKK, corresponding to amino acid residues 45-56 of rat VGLUT2 (Accession Q9JI12). Cytoplasmic, N-terminus. Homology Mouse - identical; human - 11/12 amino acid residues identical. 1-3. Anti-VGLUT2 Antibody (#AGC-036), (1:400). 4-6. Anti-VGLUT2 Antibody, preincubated with the control peptide antigen. Immunohistochemical staining of rat frozen brain sections using Anti-VGLUT2 Antibody (#AGC-036), (1:400). 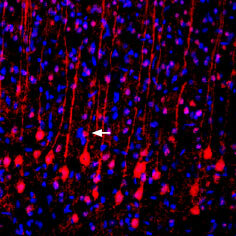 VGLUT2 (red) is detected in pyramidal neurons (arrow). The same section was stained with DAPI (blue). Gong, J. et al. (2006) Brain Res. 1082, 73. Fremeau, R.T. et al. (2004) Science 304, 1815. Takamori, S. et al. (2000) Nature 407, 189. Maycox, P.R. et al. (1988) J. Biol. Chem. 263, 15423. Gras, C. et al. (2002) J. Neurosci. 22, 5442. Moechars, D. et al (2006) J. Neurosci. 26, 12055. Central nervous system neurons have traditionally been thought to express exclusively membrane transporters and/or vesicular transporters for their transmitter. Three vesicular glutamate transporters (VGLUTs) have been cloned: BNPI/VGLUT1 (a brain-specific sodium dependent inorganic phosphate (Pi) transporter), and its homologs DNPI/VGLUT2 (differentiation-associated sodium-dependent Pi transporter) and VGLUT31. These transporters mediate glutamate uptake inside presynaptic vesicles and are anatomical and functional markers of glutamatergic excitatory transmission2. BNPI/DNPI encodes a membrane protein with 6-8 putative transmembrane domains which exhibits weak similarities to a kidney Na+-dependent inorganic phosphate co-transporter3. The transporters use a membrane potential gradient set by the vesicular H+-ATPase for glutamate uptake4. VGLUT1-3 are very similar in structure and function, but are used by different neuronal populations. 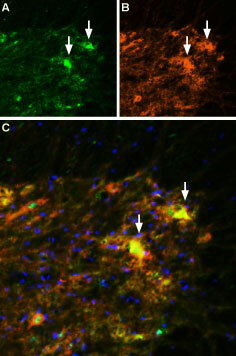 VGLUT1 and VGLUT2 are expressed by the cortical and subcortical neurons respectively. VGLUT3 is expressed by non-glutamatergic neurons5. 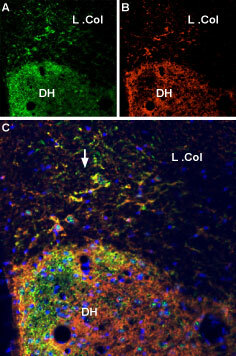 VGLUT2 is expressed in the thalamus, brainstem, and deep cerebellar nuclei2. A Recent study has shown that targeted deletion of VGLUT2 in mice causes perinatal lethality and a 95% reduction in evoked glutamatergic responses in thalamic neurons, although hippocampal synapses function normally. Behavioral analysis of heterozygous VGLUT2 mice showed discrete behavioral phenotypes that suggest a deficit in thalamic processing6. Immuno-colocalization of VGLUT2 and P2X7 Receptor in rat spinal cordImmunohistochemical staining of perfusion-fixed frozen rat spinal cord sections using Anti-VGLUT2 Antibody (#AGC-036), (1:600) and Anti-P2X7 Receptor-ATTO-550 Antibody (#APR-004-AO), (1:100). A. VGLUT2 labeling followed by goat-anti-rabbit-Alexa-488 (green). B. The same section labeled for P2X7 receptor (orange). C. Merge of A and B demonstrates partial co-localization of Vesicular glutamate transporter 2 and P2X7 receptor in the ventral horn (arrow). Cell nuclei were stained with DAPI (blue). Anti-VGLUT2 Antibody (#AGC-036) is a highly specific antibody directed against an epitope of rat Vesicular glutamate transporter 2. The antibody can be used in western blot analysis and immunohistochemistry applications. It has been designed to recognize VGLUT2 from rat, mouse and human samples. Song, M. et al. (2017) Neurobiol. Dis. 98, 9. Anti-VGLUT2-ATTO-594 Antibody (#AGC-036-AR). A fluorescent labeled primary antibody. It can be used in immuno-colocalization studies in conjunction with any of our antibodies raised in rabbit.